I'm a post-doctoral researcher at Prof. Luc Van Gool's group. My main interests are object detection and tracking from moving platforms in urban scenarios, as well as SLAM and 3D reconstruction. When observing a traffic scene from inside a vehicle, a human observer will usually pay attention to a multitude of different scene objects in parallel: one can identify other traffic agents such as cars and pedestrians, and predict their further motion, or even interpret their intention. At the same time, one needs to stay clear of any obstacles, remain on the assigned road, and read/interpret any traffic signs on the side of street. On top that, a human is able to assess the situation: when close to a school or pedestrian crossing, one ideally will adapt one's driving behavior. While humans seem to be able to perform all these tasks in parallel without too much effort, urban scene analysis remains a difficult task for a computer. To this end, I have been working on various projects towards this goal, mostly looking at specific sub-problems and combining them in a system's perspective. Most of my work has been published at major conferences/journals in the Computer Vision and Robotics communities. Together with my co-authors Bastian Leibe, Konrad Schindler, and Luc Van Gool, we have obtained the Best Vision Paper Award at the International Conference on Robotics and Automation (ICRA), held in Kobe, May 2009! The rewarded work finds and tracks pedestrians in realistic shopping street environments, from a mobile platform (either a car or a robot-like platform). The following gives a short overview over my projects in urban scene analysis, including the most relevant papers. Multi-body tracking. Most of my current work focuses on tracking pedestrians from mobile platforms. 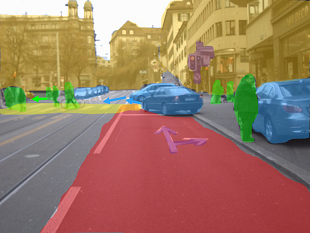 The idea is to equip robots or cars with vision systems that can oversee the traffic situation around the car and that can give an early warning for dangerous situations. The system finds people, tracks them, and determines their trajectory relative to the mobile platform from which the images are taken. We tested our system in busy urban scenarios, and provide the corresponding dataset for other researchers. The underlying methodology is to integrate different functionalities that thus far have been mainly developed separately in computer vision: recognition - tracking - 3D reconstruction for egomotion extraction. Social behavior modeling. In recent research, we investigated computational models for the social interaction between people. The key idea is to statistically explore the collision avoidance and grouping behavior between people and their environments to improve tracking performance and gain a better understanding of a scene. To this end, we learned statistical models of both typical constellations and behaviors of walking people from overhead cameras and applied them to the problem of tracking from moving platforms. This research is also at the intersection with social simulations, which are important in the design of buildings (evacuation dynamics) as well as computer graphics (crowd simulations). Grouping behavior in general is also a phenomenon that has recently seen growing interest, e.g., for handling uncertainties of face recognition in large image collections. Urban traffic scene understanding. Besides tracking moving objects, we are also interested in analyzing the scene in front of the observer in a more holistic approach. To this end, we have developed a two-stage system that is able to infer the road type in front of the observer, along with the presence of a diverse set of object classes. Specifically, the system first applies texture classification to assign each block in an image a texture label. The labeling is then (probabilistically) used to infer the road and object categories in a discriminative approach. The paper was presented at BMVC. I maintain the fast feature detector/descriptor developed at our lab, SURF. The complete list of my publications can be found here.